“I didn’t sign up for nine snaps,” Adrian Peterson says. It’s Week 2 of the NFL season, but here we are still talking about the workload of a part-time running back for the Saints in Week 1. It’s getting pretty close to Week 2 of the NFL season, but here we are still talking about the workload of a part-time running back in Week 1. We’re talking about it because he’s still talking about it. 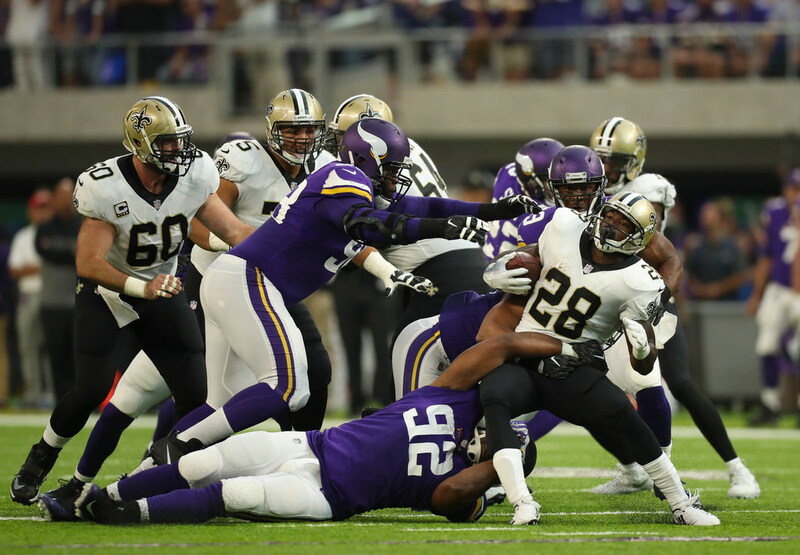 “I didn’t sign up for nine snaps,” Adrian Peterson said Thursday, referring to his workload during his Monday debut with his new team, the New Orleans Saints, against his old team, the Vikings. Peterson added that he knew getting used to a more crowded backfield than he was used to in Minnesota would take some “adjusting” and said the way Monday’s game played out factored into how much he was used. Peterson always wanted the ball during his decade in Minnesota, too. The difference is that he had earned all sorts of leverage with the Vikings by virtue of his performance. For the bulk of his career here, most fans, coaches and teammates probably agreed that the Vikings were best off in the running game when Peterson was getting a lot of touches. He is, after all, one of the best pure runners in the history of the league. One of the problems now, though, is that Peterson clearly still sees himself as the same mid-20s running back in his prime that could shred defenses instead of the 32-year-old coming off a major injury that he actually is. “Just whenever it’s in my hands, I know that’s an opportunity to take it to the house,” he said Thursday. These days, Peterson is much more likely to take it for little or no gain. On Monday against the Vikings, he had six carries for 18 yards — nine on his first carry, nine more on his final five carries. The time share in the Saints backfield was almost comically equal. Mark Ingram, a 1,000-yard rusher last season, had six carries for 17 yards. Rookie Alvin Kamara had seven carries for 18 yards. It’s hard to imagine any of those three guys was overjoyed with their output or opportunity. What the Saints might be finding out, though, is what the Vikings learned in recent years: Because Peterson is a blocking and pass-catching liability relative to other running backs, there is an element of predictability when he’s in the game (or out of the game). He played nine snaps Monday and carried the ball six of those times. The Vikings, in catering to an offense built around Peterson, often times also became quite predictable. They decided this offseason it was time to move on, and the Game 1 results — rookie Dalvin Cook ran for 122 yards, and the offense in general looked fluid and diverse — were encouraging. One has to wonder if the Saints will come to the same conclusion sooner rather than later and move on from Peterson as well. During Monday’s game, he had a sideline exchange with coach Sean Payton that needed further explanation on Twitter. He was urging the coach to run the ball, and I’m sure the head coach of an historically very good offensive team loved the input. Several days later, Peterson and playing time remained a topic of discussion. Peterson might not have signed up for nine snaps, but if things keep trending this way it wouldn’t be surprising if the Saints decided zero snaps was a better number. Which relievers do you trust in the Twins bullpen?